Keith Grey, 41, was working out in his gym when he suffered a cardiac arrest in October last year. Luckily for primary schoolteacher Keith, the staff at the Central YMCA Club, Bloomsbury, had been trained by the London Ambulance Service in basic life support and how to use a defibrillator. The gym has a public-access defibrillator which was partly funded by the British Heart Foundation. Gym staff immediately recognised Keith’s symptoms, called 999 for an ambulance and began basic life support. They shocked his heart with the defibrillator and his heartbeat returned. A motorcycle paramedic, ambulance crew and single responder arrived soon afterwards and provided advanced life support. Keith was taken to University College Hospital for further treatment. Keith was diagnosed with an irregular heart rhythm and fitted with an internal cardioverter defibrillator. He was back at work in the New Year. 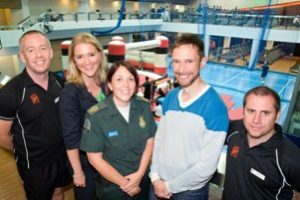 Central YMCA Club Director Barry Cronin said: “With an average of 1,000 people using Central YMCA Club every day, we believe it is vital that our staff are fully trained and confident in basic life support and in using defibrillators. Pictured left to right: Declan Duncan, Victoria Hollins (BBC reporter) Emama Pickard, Keith Grey and Danny Potts.